Complete our simple online registration and get your number today! The deadline for getting your number for the Fall/Winter event is Monday, August 27. Everyone must pre-register to obtain a consignor number. ALL RETURNING CONSIGNORS need to sign-up for the current event by clicking here. IMPORTANT NOTE: Your consignor number is considered a lifetime number. Please continue to use the same number for each event in which you participate. Please refer to our READY… SET… TAG section for detailed instructions. This is the key part of our system. Every item must have a tag with a “sticker” barcode attached. Barcodes can be ordered online then printed from home on Avery 5160 labels. Consignors will have instant access to ordering and printing their own barcodes anytime! Start ordering your barcodes today and have them TODAY! Wow… now that’s exciting! CLICK HERE for all the details. PLEASE NOTE: You WILL NOT be able to print barcodes from home during the event. All orders after Midnight on Tuesday, before drop-off, will need to be printed at the store during drop-off. If you need barcodes printed, please bring your barcode tally with you to drop-off. Review all the information on ordering barcodes by CLICKING HERE. If you do not have access to a printer or find you are having challenges, please CONTACT US. Refer to the event schedule to determine your specific drop-off day. PLEASE NOTE: If you choose to wait until drop-off to order your barcodes, be sure and bring a tally of what you need and allow plenty of time to adhere your stickers to each tag. We recommend that you place your BARCODE ORDERS online. Our new system allows you to simply print your order from home. Saving you time and hassle at drop-off! Step 5: Shop the Consignors Only Private Sale! As a consignor you earn the privilege to shop before the public! The Consignors Only Private Sale will be held on Tuesday. No children under 10 are permitted during the private sale. You will receive a pass to the private sale during drop-off. There is a minimum of 25 acceptable items required to earn a private sale pass. 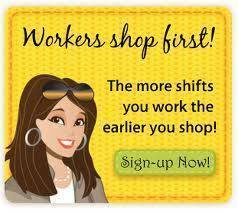 Want to shop even earlier? Check out our WORKER INCENTIVES! Step 6: Finish by picking up or donating your unsold items. It is your choice to pick-up or donate your unsold items. Please follow tagging instructions carefully. All cards NOT highlighted will be automatically donated. All others will be sorted and ready for pick-up. You can pick-up your check and unsold items on Wednesday, Noon to 7:00pm. Please refer to our CALENDAR. All items left after 7:00pm will be donated to Potter Children’s Home. Step 7: Collect your check following the sale. You can pick up your unsold items along with your check on Wednesday from 2:00pm to 7:00pm! If you are not planning to come during pick-up or have decided to donate your items following the event, you may wish to have your check mailed. If so, you must provide a self-addressed stamped envelope when registering at drop-off. A $5.00 processing fee will be deducted from your earnings if you choose not to pick up your check and you have not provided an envelope during drop-off. Please check FAQ’s for other questions, or you may contact us!